The Grimek-Lurie Challenge: What Really Happened? Was America's most muscular man decided once and for all? Find out in this exclusive interview with the man behind the challenge, Dan Lurie. When three-time America&apos;s most muscular man Dan Lurie, challenged two-time AAU Mr. America John Grimek back in December 1945 to a pose-off to determine, once and for all, the most muscular man in America, no one could have predicted the fiasco that was to follow. On the basis of his self-professed superior conditioning and muscularity, Dan issued his now infamous challenge to Grimek with the intention of having both physiques judged fairly in what he considered to be an event of potential historical significance. Dan also felt in his heart he could win. "I admired John Grimek&apos;s massiveness. But if you look close, as a judge would, his weak points were obvious. He had no pectorals at all, they were completely flat. He had no abdominal muscles also," says Dan. "I was more like Frank Zane, all cut up with a lot of definition. When determining the most muscular physique, that is what you look for." What promoted Dan to challenge Grimek was the widely held belief, at the time, that Grimek was indeed the most muscular man in the world. At this point Grimek had won the AAU Mr. American twice, with a physique layered with unparalleled size. Many felt that, despite the fact that Steve Reeves was making his mark on the bodybuilding world at this time, John Grimek was the greatest, most muscular, bodybuilder ever. This was not the case according to Dan Lurie. Dan felt he alone was America&apos;s most muscular man. Indeed, he won the title three times undefeated - the only man ever to do so. Thus, a challenge was issued to Grimek and Dan readied himself for the ultimate pose-off. How did Grimek reply to Dan&apos;s challenge? According to Dan, a 200-word barrage of insults comprised the bulk of Grimek&apos;s reply. Grimek felt Dan had no right to challenge him and brushed it off as unworthy of consideration. Dan countered with a business proposition: they could pose-off at a popular venue and split the profits. Nothing further was said and until months later when a Strength and Health article got everyone talking. The article stated a pose-off between Dan and Grimek would take place at Turners Hall, Philadelphia, May 4, 1946. It is worth noting that Strength and Health was, at the time, a publication run by Bob Hoffman, who also promoted Grimek when the challenge in question was issued. News of this challenge hit Dan like a thunderbolt as he had already figured it would not take place. So was Dan ready to rumble? You bet he was, and off he went to Turners Hall to take the title he believed was rightfully his. So, did these two legends of the sport pose-off in a historical bodybuilding showdown? Was America&apos;s most muscular man decided once and for all? Find out in this exclusive interview with the man behind the challenge, Dan Lurie. Why exactly was your, now infamous, 1945 challenge to John Grimek? What were your reasons? 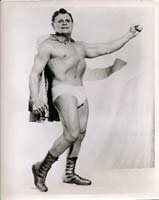 In the early 40s, after I won the America&apos;s Most Muscular Man title three years in a row, Strength and Health never used my picture and never said I was America&apos;s most muscular man. Whenever they showed a picture of John Grimek, they said he was the world&apos;s most muscular man. Bob Hoffman promoted Grimek as much as possible and wanted him to be the greatest Mr. America that ever lived, but Grimek wasn&apos;t the greatest ever. I felt that it wasn&apos;t fair how I was being treated, so I issued a simple letter to Grimek, in which I said I believed he was probably better built than I but as far as being most muscular - that was a different category. John was big and thick, but never had abdominal muscles and never had pectoral muscles. I thought he would just answer politely, but he answered me in a very nasty way. We went back and forth, and I said to myself, "This could be business deal." It started to attract a lot of attention. So I spoke to John through letters, and suggested what we could do. I said we could book a hall and run the challenge, maybe in Madison Square Garden, or some other well known place, and split the receipts. We get fair judging and whoever wins, wins. Before I knew it - months later - there is an article in Strength and Health (Hoffman&apos;s publication) saying the challenge was going to take place in Turners Hall, Philadelphia, in 1946. It became a big deal because Weider was plugging me and Hoffman was plugging Grimek. I had to go on my own. Weider did not want to go because he had to face Hoffman for some reason. When I got there I had to buy an admission ticket and sit in the back row of the hall on my own. After a while, Bob Hoffman was heard saying that Dan Lurie was in the audience, and was too afraid to challenge Grimek. Winner of two AAU Mr. America titles (the only man to do so), and owner one of the more massive physiques of his time, John Grimek has gone down in history as being the first bodybuilder to retire from the sport undefeated. Weight: 210 lbs (in 1949). Retired from the York Barbell Company in 1985. Passed away on November 20, 1998, at the age of 88. Read Dan&apos;s challenge to John Grimek in its entirety: The Challenge. Had the contest not already been arranged? Why were you in the audience, and what happened next? I was not told to go on stage. They were talking about me while I was in the audience, trying to get me enraged. I didn&apos;t say anything, I just sat there. Then they said John Grimek is an amateur and Dan Lurie is a professional and therefore they cannot compete against one another. Hadn&apos;t they figured this out before the challenge got to this point? They had already picked a place, and over 3000 people attended - there was a lot of interest shown. The challenge was changed when Hoffman said instead of it being a two-man challenge; let&apos;s make it into a contest where anyone in the world could compete. So they firstly had the amateur part. During this part Bob Hoffman kept referring to me while I was in the audience, baiting me, and telling me to come up. The audience was chanting, "We want Lurie, we want Lurie". I then get up, and rather than go backstage - I knew the thing was all a set-up but I was too young at age 23 to understand exactly what was happening - I went right onto the stage. Bob Hoffman said, "Get the hell off here." I thought about what to do next. I went right to the microphone and said, "Can I please speak?" He didn&apos;t want me to say anything, and when I asked to speak, a lot of the people said let him speak. So he had no choice but to give me the microphone. And I said, "As you all know, I was here to challenge John Grimek and now they say I am professional." I said I would be glad to compete. They put Sig Klein next to me, who was age 45. They had another guy who became a good friend of mine, Walter Podolak. He was a wrestler who went by the name of "The Golden Superman". He was no bodybuilder. He worked with weights, but had no definition. I said that it could not be a fair contest between Klein and myself, because Bob Hoffman picked the judges. Even though the judges might be fair, they were picked by Hoffman. I said there is only one way I would compete: have the audience decide. The audience said yes, yes, yes. However, this never happened. So I went backstage and put on my trunks. When Sig Klein came out to pose - he posed first - Bob Hoffman, who was the MC, said, "Look at Sig Klein, look at his abdominal, and oblique, muscles." He was listing all of Grimek&apos;s good points as he posed. Then, when I posed, he didn&apos;t say a word. Then, Walter Podolak came out. When it came time to announce the verdict that Klein beat me, according to the Philadelphia paper, there was a riot in the back of the auditorium - people were throwing chairs, they were unhappy about how this kid was getting cheated. Then they said that I beat Walter Podolak by two-points. I was told, later on, that Bob Hoffman hired Podolak - paid him $100 - to come to the show and sit in the audience. He would then come up on stage at a later point and pose. Podolak didn&apos;t know what was happening but in those days $100 and transportation to the show was a good deal, so he was thrilled to do it. Podolak and I became very good friends after that, and he judged some of my shows. Podolak always told me he never knew exactly what Bob Hoffman had in mind. Of course Grimek won the most muscular contest that night against whoever they had competing, and I lost to Sig Klein by a lot. Sig Klein never had legs. Nice upper body, nice abs, but no legs. Another thing: he never, ever, entered any competitions before the one where he competed against me. A lot of people who were at this contest, who are still alive today remember it and say how much of a joke it was. What was the aftermath of the Grimek challenge? Was another challenge issued? Weider printed what happened in his publications. Bob Hoffman went on to print his story, which was completely different to what happened. In Strength and Health, everything was written to favor them. I could not change a thing. I wrote my article to say what really happened. Only recently, after John Grimek died, I met up with his wife at an old timer&apos;s barbell club banquet. We took pictures together. This was the closest contact I got to Grimek. He never wanted to be friendly with me because when I teamed up with Joe Weider, he saw me as his enemy - the competition. A couple of times I went to the AAU shows and Grimek would be there. I would go to shake his hand, and he would refuse to shake my hand. Despite everything you have said, did you ever admire John Grimek? I always admired him and respected him. 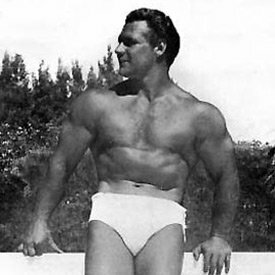 He was older than I was and had the backing of Bob Hoffman, who controlled bodybuilding in the early 1940s and 50s, before Weider got stronger. I admired John Grimek&apos;s massiveness. But if you look close, as a judge would, his weak points were obvious. He had no pectorals at all, they were completely flat. He had no abdominal muscles also. But everything else he had was perfect. I was told, but I have no proof, that York (controlled by Hoffman) used to give steroids to their lifting team to make them win, and that Grimek was taking steroids. I don&apos;t know for sure because I wasn&apos;t there. 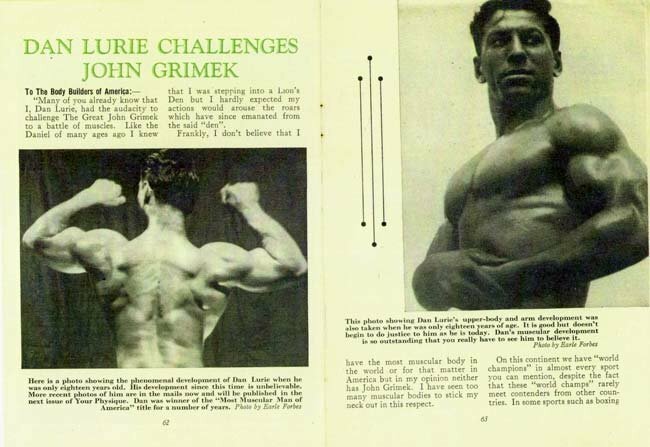 You have to remember that John Grimek was not a bodybuilder; he was strictly a lifter - a very strong weightlifter. If you look at his pictures you will see the lack of balance. He gets lost in his massive frame. As far as you could tell, what was John Grimek like as a person? I never knew him, other then the few times I went to shake his hand at dinners or AAU events. He refused to shake my hand. He always held a grudge. I never held a grudge against him. Why would I? So there were no other challenges? The only other person I challenged was Joe Weider because he always bragged about how much of a champion bodybuilder and trainer of champions he was. I asked him to really show the people what he looked like. I put the challenge of the cover of one of my magazines, but he just ignored it. We got all the pictures where he got his head and put it on the body of the Mr Universe winner. He did this so he could look back and say that that was how he looked in competition shape. It was a lie. Obviously John Grimek is a different story, You genuinely felt you could outmuscle Grimek? I was only interested in comparing muscularity. There is a difference between a body like Frank Leight&apos;s who was big and bulky and Frank Zane who was perfect. I was more like Frank Zane, all cut up with a lot of definition. When determining the most muscular physique, that is what you look for. There is no question in my mind that the decision would have been very fair had I of beaten out John Grimek in a most muscular contest. I am not taking anything else away from John. I would have beaten him in muscularity, not necessarily anything else. That&apos;s what they went for in those days - more definition and cuts. Compared to the guys of today - who are loaded with steroids - I would look like a woman. Have there been any long-term consequences for you, stemming from the challenge you issued to John Grimek? You have to remember this all happened in 1946. 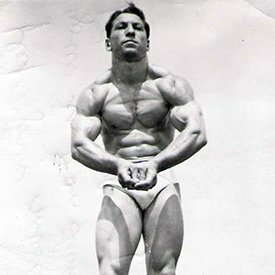 From 42 to 48 I was partners with Joe Weider, so it got some attention then, but after I broke off with Joe in 1948, I had nothing happening until 1965. The new people hadn&apos;t even heard of me because Weider would not print my pictures, and Hoffman would never print my pictures. And Perry Reeder who printed a fair publication in Iron Man, for some reason, never printed any of my pictures. I always treated my magazine like a newspaper. A newspaper has to print everything that goes on, not just one side. We touched on this earlier, but if a challenge had taken place what would the outcome have been in your view? Well, it&apos;s not for me to say. If they had non-biased judges, not picked by Bob Hoffman, who knows. Even though Bob Hoffman held me back from winning the Mr. America for three years he also would have done anything in his power to make sure I didn&apos;t win the most muscular against Grimek. In saying all this, the record stands that no one in the history of AAU bodybuilding competition has ever won the most muscular title three-years-in-a-row undefeated, except for me. The Bob Hoffman-run show at which Dan Lurie was to challenge John Grimek, attracted 3000 people and grossed $30,000, a substantial amount of money in the mid-40s. Hoffman kept all the profits. It seems he outsmarted the kid from Brooklyn, New York.